The most painful part of any car trip is paying for the gas – but a close second is paying for hotel rooms. An overpriced little box that you spend a few hours in before setting out again seems like a sadistic joke on behalf of the travel industry. 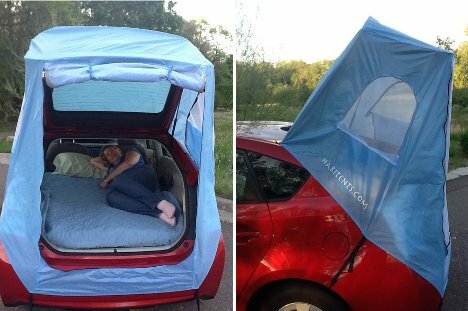 Habitents are an innovative kind of sleeping chamber that attaches to the back of a Prius to let you and one other person stretch out in your car. The Habitent attaches to your car’s open hatchback with some straps – no poles needed. 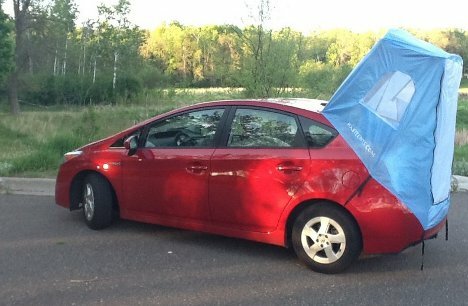 When it’s fully extended the tent measures 80″ X 40″ and when folded up it fits into your glove compartment. At $90, the Habitent easily pays for itself – maybe even on the first or second night, depending on how much you usually spend on a hotel room. The tent only fits 2003 and newer Priuses, but the company is working on a version that will fit all hatchbacks. See more in Cars & Trucks or under Transportation. June, 2012.